As operating margins and overall sales for Japanese auto manufacturers dive, the market is taking notice. 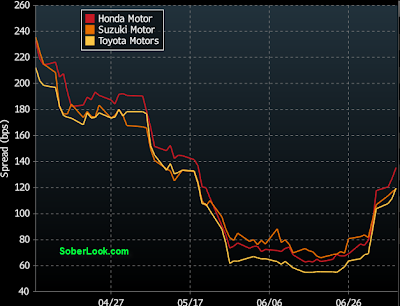 Honda total car sales decreased 43.8 percent to 52,662 and Honda light truck sales decreased 5.6 percent to 39,478. Honda Division posted June sales of 92,140, a decline of 32.0 percent versus June 2008. Toyota is having a tough time as well with Camry sales down 37 percent and Corolla sales dropping 53 percent. 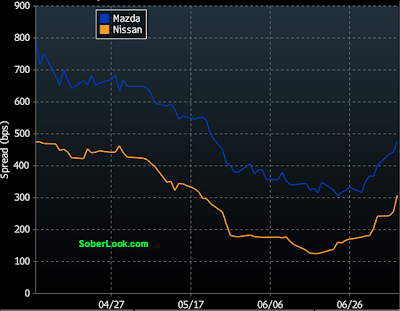 The realization is setting in that auto sales globally are not about to recover any time soon. CDS have widened significantly as the increased risk is getting priced in. 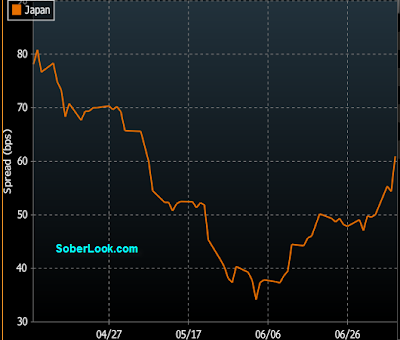 That weakness is now also showing up in Japan's sovereign credit as well.